Living with Cerebral Palsy correlates studies made in early life in patients with cerebral palsy with the status and social adjustment of the same individuals when they become adult. 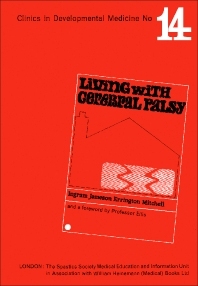 This book discusses the problem of fitting handicapped patients for life in the community after leaving school. Organized into eight chapters, this book begins with an overview of the fate of patients suffering from cerebral palsy once they outgrow childhood and come to seek employment or vocation in adult life. This text then examines the classification of cerebral palsy. Other chapters consider the likelihood of the handicapped being able to work in open employment or sheltered conditions, or of being unemployable. This book discusses as well information about personal relationships and social life of patients. The final chapter deals with the prevalence of cerebral palsy and the types of cerebral palsy encountered in a given community. This book is a valuable resource for teachers, social workers, therapists, psychologists, and physicians.